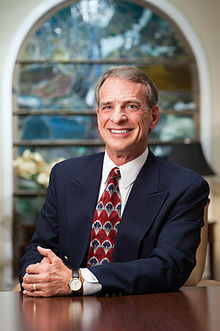 William Lane Craig (born August 23, 1949) is an American analytic philosopher and Christian theologian. He holds faculty positions at Talbot School of Theology (Biola University) and Houston Baptist University. Craig has developed and defended the Kalam Cosmological Argument for the existence of God. He also focused in his published work on a historical argument for the resurrection of Jesus. His research on divine aseity and Platonism culminated with his book God Over All. He has also debated the existence of God with public figures such as Sam Harris, Christopher Hitchens, Lawrence M. Krauss and A. C. Grayling. Craig established and runs the online apologetics ministry ReasonableFaith.org. Born August 23, 1949, in Peoria, Illinois, Craig is the second of three children born to Mallory and Doris Craig. His father's work with the T. P. & W. railroad took the family to Keokuk, Iowa, until his transfer to the home office in East Peoria in 1960. While a student at East Peoria Community High School (1963–1967), Craig became a championship debater and public speaker, being named his senior year to the all-state debate team and winning the state championship in oratory. In September 1965, his junior year, he converted to Christianity, and after graduating from high school, attended Wheaton College, majoring in communications. Craig graduated in 1971 and the following year married his wife Jan, whom he met on the staff of Campus Crusade for Christ. In 2014, he was named alumnus of the year by Wheaton. In 1973 Craig entered the program in philosophy of religion at Trinity Evangelical Divinity School north of Chicago, where he studied under Norman Geisler. In 1975 Craig commenced doctoral studies in philosophy at the University of Birmingham, England, writing on the Cosmological Argument under the direction of John Hick. He was awarded a doctorate in 1977. Out of this study came his first book, The Kalam Cosmological Argument (1979), a defense of the argument he first encountered in Hackett's work. Craig was awarded a postdoctoral fellowship in 1978 from the Alexander von Humboldt Foundation to pursue research on the historicity of the resurrection of Jesus under the direction of Wolfhart Pannenberg at the Ludwig-Maximillians-Universität München in Germany. His studies in Munich under Pannenberg's supervision led to a second doctorate, this one in theology, awarded in 1984 with the publication of his doctoral thesis, The Historical Argument for the Resurrection of Jesus During the Deist Controversy (1985). After a one-year stint at Westmont College on the outskirts of Santa Barbara, Craig moved in 1987 with his wife and two young children back to Europe, where he pursued research for the next seven years as a visiting scholar at the Katholieke Universiteit Leuven (Louvain) in Belgium. Out of that period of research issued seven books, among them God, Time, and Eternity (2001). In 1994, Craig joined the Department of Philosophy and Ethics at Talbot School of Theology in suburban Los Angeles as a Research Professor of Philosophy, a position he currently[when?] holds, and he went on to become a Professor of Philosophy at Houston Baptist University in 2014. In 2016, Craig was named Alumnus of the Year by Trinity Evangelical Divinity School. In 2017, Biola created a permanent faculty position and endowed chair, the William Lane Craig Endowed Chair in Philosophy, in honor of Craig's academic contributions. Craig served as president of the Philosophy of Time Society from 1999 to 2006. He helped found the Evangelical Philosophical Society and served as its president from 1996 to 2005. Craig has worked extensively on a version of the Cosmological Argument called the Kalam Cosmological Argument. While the Kalam has a venerable history in medieval Islamic philosophy, Craig updated the argument to interact with contemporary scientific and philosophical developments. [who said this?] Craig's research resulted in renewed contemporary interest in the argument, and in cosmological arguments in general; the philosopher Quentin Smith states: "a count of the articles in the philosophy journals shows that more articles have been published about Craig's defence of the Kalam argument than have been published about any other philosopher's contemporary formulation of an argument for God's existence." If the universe began to exist, then the universe has a cause of its beginning. Granting the strict logical consistency of post-Cantorian, axiomatized infinite set theory, Craig concludes that the existence of an actually infinite number of things is metaphysically impossible due to the consequential absurdities that arise. Craig illustrates this point using the example of Hilbert's paradox of the Grand Hotel. In Hilbert's hypothetical fully occupied hotel with infinitely many rooms, one can add an additional guest in room #1 by moving the guest in room #1 to room #2, the guest in room #2 into room #3, the guest in room #3 into room #4 and continue the shifting of rooms out to infinity. Craig points out that it is absurd to add an additional guest to a fully occupied hotel and the absurd result that the hotel has the same number of guests, infinity, both before and after adding the additional guest. Stating that the mathematical conventions stipulated to ensure the logical consistency of this type of transfinite arithmetic have no ontological force, Craig concludes that finitism is most plausibly true, which means that the series of past events in the universe must be finite, so it must have had a beginning. Craig says that just as it is impossible, despite the proponents of "super-tasks", to count to infinity, so it is metaphysically impossible to count down from infinity. Craig says that an inversion of the story of Tristram Shandy is a counter-intuitive absurdity that could result from the formation of an actual infinite. Craig claims that if the universe were eternal, an infinite number of events would have occurred before the present moment, which he says is impossible. If some event E is contingent, how can God foreknow E's occurrence? According to Craig, the first question raises the issue of theological fatalism. He attempts to reduce this problem to the problem of logical fatalism, which holds that if it is true that E will happen, then E will happen necessarily. He challenges theological fatalists to show how the addition of God's knowing some future-tense statement to be true adds anything essential to the problem over and above that statement's being true. Craig says that theological fatalists have misunderstood "temporal necessity", or the necessity of the past, and that the impossibility of backward causation does not imply that one cannot have a sort of counterfactual power over past events. Craig surveyed the rejection of parallel fatalistic arguments in fields other than theology or philosophy of religion. He reviews discussions of backward causation,time travel, the special theory of relativity, precognition, and Newcomb's paradox to conclude that fatalistic reasoning has failed. In The Tensed Theory of Time (2000) Dr. Craig examines arguments for and against a tensed understanding of time, commonly called the A-Theory of time. In The Tenseless Theory of Time (2000), Craig conducts a similar review of arguments for a tenseless construct or B-Theory of time. Elements of Craig's philosophy of time differentiates between time itself and our measures of it (a classical Newtonian theme), and includes an analysis of spatial "tenses" to the location of the "I-now", his defense of presentism, his analysis of McTaggart's paradox as an instance of the problem of temporary intrinsics, his defense of a neo-Lorentzian interpretation of special relativity, and his formulation of a tensed possible worlds semantics. Craig's two volumes The Historical Argument for the Resurrection of Jesus (1985) and Assessing the New Testament Evidence for the Historicity of the Resurrection of Jesus (3rd ed., 2002) are said by the Christian reviewers Gary Habermas and Christopher Price to be among the most thorough investigations of the event of Jesus' resurrection. [verification needed][unreliable source?] In the former volume, Craig describes the history of the discussion, including David Hume's arguments against the identification of miracles. The latter volume is an exegetical study of the New Testament material pertinent to the resurrection. The tomb of Jesus was found empty by a group of his female followers on the Sunday after his crucifixion. Various individuals and groups experienced appearances of Jesus alive after his death. The earliest disciples came to believe that God had raised Jesus from the dead despite strong predispositions to the contrary. Craig argues that the best explanation of these three events is that God raised Jesus from the dead. He rejects alternative theories such as Gerd Lüdemann's hallucination hypothesis as lacking explanatory scope, explanatory power, and sufficient historical knowledge to support the psychoanalysis Lüdemann performs. Craig's historical case for the resurrection employs standard historical practices for weighing historical hypotheses concluding that the resurrection is a better match to the available historical data. Specifically, Craig argues, that if one does not begin with the unsupported assumption that there is no God, there is a higher probability of the resurrection hypothesis than of its negation. Craig also notes that a miraculous explanation of the evidence is increased when one locates the resurrection of Jesus in the context of Jesus' ministry and personal statements. This context, Craig argues, provides the interpretive key to the meaning of Jesus' resurrection as the divine vindication of the allegedly blasphemous statements for which Jesus was tried and executed. Craig is currently[when?] focused on the challenge posed by platonism to divine aseity or self-existence. [verification needed] Craig rejects the view that God creates abstract objects and defends nominalistic perspectives on abstract objects. Stating that the Quine–Putnam indispensability thesis is the chief support of platonism, Craig criticizes Willard Van Orman Quine's naturalized epistemology and confirmational holism, and also rejects the metaontological criterion of ontological commitment. Craig is a critic of metaphysical naturalism, New Atheism, and prosperity theology, as well as a defender of Reformed epistemology. He also states that being a confessing Christian is not compatible with practicing homosexuality. [page range too broad] Craig maintains that the theory of evolution is compatible with Christianity. Craig has an agnostic position on the creation account. [not specific enough to verify] He is a fellow of the Discovery Institute's Center for Science and Culture and was a fellow of the International Society for Complexity, Information, and Design. The absence of a debate with the foremost apologist for Christian theism is a glaring omission on your CV and is of course apt to be interpreted as cowardice on your part. I notice that, by contrast, you are happy to discuss theological matters with television and radio presenters and other intellectual heavyweights like Pastor Ted Haggard of the National Association of Evangelicals and Pastor Keenan Roberts of the Colorado Hell House. Craig has also proposed an Apollinarian Christology in which the divine logos stands in for the human soul of Christ and completes his human nature. According to Nathan Schneider, "[many] professional philosophers know about him only vaguely, but in the field of philosophy of religion, [Craig's] books and articles are among the most cited". Sam Harris has described Craig as "the one Christian apologist who seems to have put the fear of God into many of my fellow atheists." Some scholars, such as Wes Morriston of the University of Colorado Boulder, have challenged some of Craig's views, such as the Kalam Cosmological argument, the foundation of God for morality, the alleged genocide of the Canaanites, as well as Craig's views on actual infinites, his fine-tuning argument, and his arguments for the resurrection of Jesus. Craig, William Lane (1980), The Cosmological Argument from Plato to Leibniz, London: MacMillan, ISBN 978-1-57910-787-1 . Craig, William Lane (1981), The Son Rises: Historical evidence for the resurrection of Jesus, Chicago: Moody Press, ISBN 978-1-57910-464-1 . Craig, William Lane (1991), Divine Foreknowledge and Human Freedom: The Coherence of Theism: Omniscience, Brill, ISBN 978-90-04-09250-1 . Craig, William Lane; Lüdemann, Gerd (2000). Copan, Paul; Tacelli, Ronald Keith (eds.). Jesus' Resurrection: Fact Or Figment? a Debate Between William Lane Craig & Gerd Lüdemann. InterVarsity Press. ISBN 978-0-8308-1569-2. Craig, William Lane; Flew, Antony; Wallace, Stan W. (2003), Does God Exist? : The Craig-Flew Debate, Ashgate, ISBN 978-0-7546-3190-3 . ———; Sinnott-Armstrong, Walter (2004). God? : A Debate Between a Christian and an Atheist. Oxford University Press. ISBN 978-0-19-516599-9. Craig, William Lane (July 3, 2008). "God is Not Dead Yet". Christianity Today. Retrieved 30 April 2014. ^ a b c d e Schneider, Nathan (July 1, 2013). "The New Theist: How William Lane Craig Became Christian Philosophy's Boldest Apostle". The Chronicle of Higher Education. Washington. Retrieved January 22, 2018. ^ Craig & Carroll 2016, p. 102. ^ a b c Craig, William Lane (August 23, 2011). "Dr. Craig's Favorite Philosopher, Debate, and Books". Reasonable Faith (podcast). Interviewed by Harris, Kevin. Retrieved September 30, 2018. ^ Alvarez 2013, p. 238. ^ Roach, David (September 8, 2014). "Theologian Wolfhart Pannenberg Dies". Baptist Press. Southern Baptist Convention. Retrieved September 30, 2018. ^ Creel 2014, p. 205. ^ "William Lane Craig" 2007. ^ a b c Craig, William Lane. "Curriculum Vitae". Reasonable Faith. Archived from the original on June 1, 2017. Retrieved September 29, 2018. ^ Craig, William Lane. "Debating". Reasonable Faith. Archived from the original on May 12, 2014. Retrieved May 8, 2014. ^ a b c d Robinson & Baggett 2016, p. 211. ^ "Records and History – Original Oratory". Illinois High School Association. Retrieved May 27, 2015. ^ a b "William Lane Craig". La Mirada, California: Biola University. Archived from the original on August 14, 2014. Retrieved May 5, 2014. ^ "William Lane Craig and Sean McDowell". Fervr. Retrieved May 11, 2014. ^ Robinson & Baggett 2016, p. 212. ^ Schneider, Nathan (July 12, 2013). "7 Habits of a Highly Effective Philosopher". Killing the Buddha. Retrieved May 10, 2014. ^ a b "Dr. William Lane Craig Named Alumnus of the Year". Wheaton, Illinois: Wheaton College. May 7, 2014. Archived from the original on May 12, 2014. Retrieved May 11, 2014. ^ Robinson & Baggett 2016, pp. 211–212. ^ Craig, William Lane. "Double Doctorates". Reasonable Faith. Archived from the original on May 12, 2014. Retrieved May 10, 2014. ^ a b "William Lane Craig". calvin.edu. Calvin College. Retrieved 9 April 2019. ^ Robinson & Baggett 2016, p. 211; "William Lane Craig" 2007. ^ Craig, William Lane (April 28, 2013). "Creation and Evolution (Part 2)". Defenders Podcast. Reasonable Faith. Retrieved October 1, 2018. ^ "The historical argument for the Resurrection of Jesus during the Deist controversy". WorldCat. Online Computer Library Center. Retrieved 9 April 2019. ^ Stafforini, Pablo (August 18, 2016). "William Lane Craig: A Complete List of Debates". Pablo's Miscellany. Pablo Stafforini. Archived from the original on June 11, 2017. Retrieved October 16, 2016. ^ Trinity International University (July 22, 2016). "William Lane Craig Named TEDS Alumnus of the Year". Buffalo Grove Countryside. Archived from the original on July 26, 2016. Retrieved September 30, 2018. ^ Wu, Joanna (Spring 2017). "William Lane Craig Named in Biola's First Endowed Chair". Biola Magazine. La Mirada, California: Biola University. p. 15. Retrieved September 30, 2018. ^ a b Robinson & Baggett 2016, p. 213. ^ Cowan & Spiegel 2009, pp. 268–269; Jackson 2014, p. 19; Peterson et al. 2013, pp. 86–89; Reichenbach 2017; Williams 2013, p. 89. ^ "Who's Who: Modern Authors: William Lane Craig (Entry 2)". Philosophy of Religion.info. Retrieved 16 October 2016. ^ Smith 2007, p. 183. ^ Craig outlines this argument and seven others for the existence of God in Craig, William Lane (2013). "Does God Exist?". Philosophy Now. No. 99. London. ISSN 0961-5970. Retrieved September 29, 2018. ^ Craig, William Lane. "The Kalam Cosmological Argument". Reasonable Faith. Retrieved September 29, 2018. ^ Craig & Sinclair 2009, p. 103. ^ Craig & Sinclair 2009, pp. 106–107. ^ Craig, William Lane (May 17, 2009). "Pruss on Forming an Actual Infinite by Successive Addition". Reasonable Faith. Archived from the original on May 18, 2009. Retrieved May 10, 2014. ^ Craig & Sinclair 2009, p. 125. ^ Mitchell, Jacqueline (May 29, 2012). "In the Beginning Was the Beginning". Tufts Now. Medford, Massachusetts: Tufts University. Retrieved May 8, 2014. ^ "Existence of God Part 11". Defenders Podcast. Reasonable Faith. Retrieved May 10, 2014. ^ Craig, William Lane. "The End of the World". Reasonable Faith. Archived from the original on May 12, 2014. Retrieved May 10, 2014. ^ Craig, William Lane (September 30, 2012). "Invasion of the Boltzmann Brains". Reasonable Faith. Archived from the original on August 6, 2014. Retrieved May 10, 2014. ^ Craig, William Lane. "Must the Beginning of the Universe Have a Personal Cause?". Reasonable Faith. Archived from the original on May 12, 2014. Retrieved May 10, 2014. ^ Craig, William Lane (January 7, 2008). "Molinism and Free Will". Reasonable Faith. Archived from the original on June 25, 2014. Retrieved May 10, 2014. ^ Craig 2000b, pp. 83–88. ^ Craig 2000b, pp. 89–96. ^ Craig 2000b, pp. 97–104. ^ "Participants: Craig, William Lane". Closer to Truth. Kuhn Foundation. Archived from the original on November 8, 2011. Retrieved October 5, 2011. ^ a b Craig 2009. ^ Craig, William Lane. "Does Correspondence Preclude the Truth of Counterfactuals of Freedom?". Reasonable Faith. Archived from the original on May 12, 2014. Retrieved May 10, 2014. ^ Craig, William Lane (September 24, 2007). "Middle Knowledge". Reasonable Faith. Archived from the original on January 30, 2015. Retrieved May 10, 2014. ^ Craig, William Lane (April 19, 2010). "Molinism vs. Calvinism". Reasonable Faith. Archived from the original on June 25, 2014. Retrieved May 10, 2014. ^ Craig, William Lane. "Molinism and Divine Election". Reasonable Faith. Archived from the original on May 12, 2014. Retrieved May 10, 2014. ^ Craig, William Lane. "A Molinist Perspective on Biblical Inspiration". Reasonable Faith. Archived from the original on May 12, 2014. Retrieved May 10, 2014. ^ Craig, William Lane. "Middle Knowledge and Christian Particularism". Reasonable Faith. Archived from the original on May 12, 2014. Retrieved May 10, 2014. ^ Craig, William Lane (June 7, 2015). "Molinism and the Problem of Evil". Reasonable Faith (podcast). Interviewed by Harris, Kevin. Retrieved September 28, 2018. ^ Craig & Sinclair 2009, pp. 184–185. ^ Craig 2001c, p. 115. ^ Craig, William Lane (2000). The Tensed Theory of Time: A Critical Examination. ISBN 978-0792366348. ^ Craig, William Lane (2000). The Tenseless Theory of Time: A Critical Examination. ISBN 978-0792366355. ^ Craig 2001c, pp. 51–66. ^ Helm 2011, pp. 220ff. ^ Price, Christopher (2005). "Review of The Son Rises: The Historical Evidence for the Resurrection of Jesus by William L. Craig". Christian Colligation of Apologetics Debate Research & Evangelism. Archived from the original on November 3, 2012. Retrieved May 7, 2014. ^ Craig 2008, p. 360. ^ Perman, Matt (September 12, 2007). "Historical Evidence for the Resurrection". Desiring God. Retrieved May 7, 2014. ^ Craig, William Lane. "Visions of Jesus: A Critical Assessment of Gerd Lüdemann's Hallucination Hypothesis". Reasonable Faith. Retrieved May 7, 2014. ^ McGrew & McGrew 2009, p. 617. ^ Craig, William Lane. "The Resurrection of Jesus". Reasonable Faith. Archived from the original on October 1, 2017. Retrieved May 7, 2014. ^ Moreland & Craig 2003, pp. 506–507. ^ Craig, William Lane (October 28, 2012). "Can We Refer to Things That Are Not Present?". Reasonable Faith. Archived from the original on July 14, 2017. Retrieved May 7, 2014. ^ Nichols & Stich 1999. ^ Craig & Moreland 2000. ^ Copan & Craig 2009. ^ Craig, William Lane (March 28, 2010). "Lightning Strikes Again". Reasonable Faith. Archived from the original on May 22, 2017. Retrieved September 28, 2018. ^ "Religious Epistemology MP3 Audio by William Lane Craig". Apologetics 315. December 30, 2008. Retrieved December 8, 2016. ^ Craig 2003, pp. 129–144. ^ Zaimov, Stoyan (April 9, 2013). "Christian Apologist Says Church 'Losing Battle' Against Hate Label for Homosexuality Stance". The Christian Post. Retrieved September 28, 2018. ^ Craig, William Lane. "A Christian Perspective on Homosexuality". Reasonable Faith. Archived from the original on December 6, 2016. Retrieved September 28, 2018. ^ Craig, William Lane (May 19, 2008). "Christian Homosexuals?". Reasonable Faith. Retrieved September 28, 2018. ^ Craig, William Lane (February 20, 2012). "Evolutionary Theory and Theism". Reasonable Faith. Archived from the original on October 2, 2017. Retrieved September 28, 2018. ^ Craig, William Lane (2009). "William Lane Craig's View on Creation and Evolution". YouTube. Retrieved December 8, 2016. ^ "Doctrine of Creation". Reasonable Faith. Archived from the original on December 18, 2015. Retrieved December 8, 2016. ^ "William Lane Craig". Discovery Institute. Retrieved December 8, 2016. ^ "Society Fellows". International Society for Complexity, Information, and Design. Archived from the original on September 28, 2018. Retrieved October 9, 2011. ^ Copan & Flannagan 2014, pp. 81–82; Howson 2011, p. 11. ^ Craig, William Lane (August 8, 2011). "The 'Slaughter' of the Canaanites Re-visited". Reasonable Faith. Retrieved September 28, 2018. ^ Dawkins, Richard (October 20, 2011). "Why I Refuse to Debate with William Lane Craig". The Guardian. London. Retrieved September 28, 2018. ^ Came, Daniel (October 22, 2011). "Richard Dawkins's Refusal to Debate Is Cynical and Anti-Intellectualist". The Guardian. London. Retrieved September 28, 2018. ^ Moreland & Craig 2003, p. 608. Alvarez, Daniel R. (2013). "A Critique of Wolfhart Pannenberg's Scientific Theology". Theology and Science. 11 (3): 224–250. doi:10.1080/14746700.2013.809950. ISSN 1474-6719. Båve, Arvid (2009). "A Deflationary Theory of Reference". Synthase. 169 (1): 51–73. doi:10.1007/s11229-008-9336-4. ISSN 1573-0964. Copan, Paul; Craig, William Lane, eds. (2009). Contending with Christianity's Critics: Answering New Atheists & Other Objectors. Nashville, Tennessee: B&H Academic. ISBN 978-0-8054-4936-5. Copan, Paul; Flannagan, Matthew (2014). Did God Really Command Genocide? Coming to Terms with the Justice of God. Grand Rapids, Michigan: Baker Books. ISBN 978-0-8010-1622-6. Cowan, Steven B.; Spiegel, James S. (2009). The Love of Wisdom: A Christian Introduction to Philosophy. Nashville, Tennessee: B&H Academic. ISBN 978-0-8054-4770-5. Craig, William Lane (1979). "Wallace Matson and the Crude Cosmological Argument". Australasian Journal of Philosophy. 57 (2): 163–170. doi:10.1080/00048407912341171. ISSN 1471-6828. ——— (1985). "The Historicity of the Empty Tomb of Jesus". New Testament Studies. 31 (1): 39–67. doi:10.1017/S0028688500012911. ISSN 1469-8145. ——— (1986). "The Problem of Miracles: A Historical and Philosophical Perspective". In Wenham, David; Blomberg, Craig (eds.). Gospel Perspectives. 6. Sheffield, England: JSOT Press. pp. 9–40. ——— (1987). "Divine Foreknowledge and Newcomb's Paradox". Philosophia. 17 (3): 331–350. doi:10.1007/bf02455055. ISSN 1574-9274. ——— (1990). "Purtill on Fatalism and Truth". Faith and Philosophy. 7 (2): 229–234. doi:10.5840/faithphil19907219. ISSN 2153-3393. ——— (1991). "'Lest Anyone Should Fall': A Middle Knowledge Perspective on Perseverance and Apostolic Warnings". International Journal for Philosophy of Religion. 29 (2): 65–74. doi:10.1007/bf00133805. ISSN 1572-8684. ——— (1992). "God and the Initial Cosmological Singularity: A Reply to Quentin Smith". Faith and Philosophy. 9 (2): 238–248. doi:10.5840/faithphil19929217. ISSN 2153-3393. ——— (1996). "A Critique of Grudem's Formulation and Defense of the Doctrine of Eternity". Philosophia Christi. 1 (19): 33–38. ——— (1998a). "Divine Timelessness and Personhood". International Journal for Philosophy of Religion. 43 (2): 109–124. doi:10.1023/A:1003137728724. ISSN 1572-8684. ——— (1998b). "Rediscovering the Historical Jesus: The Evidence for Jesus". Faith and Mission. 15 (2): 16–26. Retrieved September 28, 2018. ——— (2000a). "Omniscience, Tensed Facts, and Divine Eternity". Faith and Philosophy. 17 (2): 225–241. doi:10.5840/faithphil200017216. ISSN 2153-3393. ——— (2000b) . The Only Wise God: The Compatibility of Divine Foreknowledge and Human Freedom. Eugene, Oregon: Wipf and Stock Publishers. ISBN 978-1-57910-316-3. ——— (2000c). "Timelessness and Omnitemporality". Philosophia Christi. 2. 2 (1): 29–33. doi:10.5840/pc2000215. ISSN 1529-1634. Retrieved September 28, 2018. ——— (2001a). "God and the Beginning of Time". International Philosophical Quarterly. 41 (1): 17–31. doi:10.5840/ipq200141159. ISSN 2153-8077. ——— (2001b). "Reply to Evan Fales: On the Empty Tomb of Jesus". Philosophia Christi. 2. 3 (1): 67–76. ISSN 1529-1634. ——— (2001c). Time and Eternity: Exploring God's Relationship to Time. Wheaton, Illinois: Crossway Books. ISBN 978-1-58134-241-3. ——— (2003). Hard Questions, Real Answers. Wheaton, Illinois: Crossway Books. ISBN 978-1-4335-1684-9. ——— (2008). Reasonable Faith: Christian Truth and Apologetics (3rd ed.). Wheaton, Illinois: Crossway Books. ISBN 978-1-4335-0115-9. ——— (2009). "Divine Eternity". In Flint, Thomas P.; Rea, Michael C. (eds.). The Oxford Handbook of Philosophical Theology. New York: Oxford University Press. pp. 145–166. doi:10.1093/oxfordhb/9780199596539.013.0008. ISBN 978-0-19-959653-9. ——— (2012a). "God and Abstract Objects". In Stump, J. B.; Padgett, Alan G. (eds.). The Blackwell Companion to Science and Christianity. Malden, Massachusetts: Wiley-Blackwell. pp. 441–452. doi:10.1002/9781118241455.ch38. ISBN 978-1-4443-3571-2. ——— (2012b). "Nominalism and Divine Aseity". In Kvanvig, Jonathan (ed.). Oxford Studies in Philosophy of Religion. 4. Oxford: Oxford University Press. pp. 44–65. doi:10.1093/acprof:oso/9780199656417.003.0003. ISBN 978-0-19-965641-7. ——— (2014). "Anti-Platonism". In Gould, Paul M. (ed.). Beyond the Control of God? Six Views on the Problem of God and Abstract. New York: Bloomsbury Academic. pp. 113–126. ISBN 978-1-62356-365-3. Craig, William Lane; Carroll, Sean (2016). God and Cosmology: William Lane Craig and Sean Carroll in Dialogue. Minneapolis, Minnesota: Fortress Press. ISBN 978-1-5064-0676-3. Craig, William Lane; Moreland, J. P., eds. (2000). Naturalism: A Critical Analysis. Routledge Studies in Twentieth Century Philosophy. 6. London: Routledge. ISBN 978-0-415-23524-2. Craig, William Lane; Sinclair, James D. (2009). "The Kalam Cosmological Argument". In Craig, William Lane; Moreland, J. P. (eds.). The Blackwell Companion to Natural Theology. Chichester, England: Wiley-Blackwell. pp. 101–201. doi:10.1002/9781444308334.ch3. ISBN 978-1-4051-7657-6. Creel, Richard E. (2014). Philosophy of Religion: The Basics. Chichester, England: Wiley-Blackwell. ISBN 978-1-118-61945-2. Habermas, Gary (1988). "Review of The Historical Argument for the Resurrection of Jesus During the Deist Controversy by William Lane Craig". Journal of the Evangelical Theological Society. 31 (2): 240–242. ISSN 0360-8808. Helm, Paul (2011). Eternal God: A Study of God Without Time (2nd ed.). Oxford: Oxford University Press. doi:10.1093/acprof:oso/9780199590391.001.0001. ISBN 978-0-19-959038-4. Howson, Colin (2011). Objecting to God. Cambridge, England: Cambridge University Press. ISBN 978-0-521-76835-1. Jackson, Roy (2014). The God of Philosophy: An Introduction to the Philosophy of Religion. Oxford: Routledge. ISBN 978-1-84465-501-4. Jantzen, Benjamin C. (2014). An Introduction to Design Arguments. Cambridge, England: Cambridge University Press. doi:10.1017/CBO9780511793882. ISBN 978-0-511-79388-2. Law, Stephen (2011). "Evidence, Miracles, and the Existence of Jesus". Faith and Philosophy. 28 (2): 129–151. doi:10.5840/faithphil20112821. ISSN 2153-3393. Liggins, David (2008). "Quine, Putnam, and the 'Quine-Putnam' Indispensability Argument". Erkenntnis. 68 (1): 113–127. doi:10.1007/s10670-007-9081-y. ISSN 1572-8420. McGrew, Timothy; McGrew, Lydia (2009). "The Argument from Miracles: A Cumulative Case for the Resurrection of Jesus of Nazareth". In Craig, William Lane; Moreland, J. P. (eds.). The Blackwell Companion to Natural Theology. Chichester, England: Wiley-Blackwell. pp. 593–662. doi:10.1002/9781444308334.ch11. ISBN 978-1-4051-7657-6. Moreland, J. P.; Craig, William Lane (2003). Philosophical Foundations for a Christian Worldview. Downers Grove, Illinois: InterVarsity Press. ISBN 978-0-8308-2694-0. Morriston, Wes (2009). "Did God Command Genocide? A Challenge to the Biblical Inerrantist" (PDF). Philosophia Christi. 2. 11 (1): 7–26. doi:10.5840/pc20091112. ISSN 1529-1634. Retrieved September 28, 2018. ——— (2012). "God and the Ontological Foundation of Morality". Religious Studies. 48 (1): 15–34. doi:10.1017/S0034412510000740. ISSN 1469-901X. ——— (2013). "Doubts About the Kalam Argument". In Moreland, J. P.; Meister, Chad; Sweis, Khaldoun A. (eds.). Debating Christian Theism. New York: Oxford University Press. pp. 20–32. ISBN 978-0-19-975543-1. ——— (2018). "Craig on the Actual Infinite". In Copan, Paul; Craig, William Lane (eds.). The Kalam Cosmological Argument. Volume 1: Philosophical Arguments for the Finitude of the Past. New York: Bloomsbury Academic. doi:10.5040/9781501330827. ISBN 978-1-5013-3082-7. Nichols, Shaun; Stich, Stephen (1999). "A Cognitive Theory of Pretense". New Brunswick, New Jersey: Rutgers University. Archived from the original on June 5, 2008. Retrieved September 28, 2018. Oaklander, L. Nathan (2002). "Presentism, Ontology and Temporal Experience". In Callender, Craig (ed.). Time, Reality & Experience. Cambridge, England: Cambridge University Press. pp. 73–90. ISBN 978-0-521-52967-9. Oppy, Graham (1995). "Reply to Craig: Inverse Operations with Transfinite Numbers and the Kalam Cosmological Argument". International Philosophical Quarterly. 35 (2): 219–221. doi:10.5840/ipq19953526. ISSN 2153-8077. Retrieved January 4, 2015. Peterson, Michael; Hasker, William; Reichenbach, Bruce; Basinger, David (2013). Reason and Religious Belief: An Introduction to the Philosophy of Religion. New York: Oxford University Press. ISBN 978-0-19-994657-0. Reichenbach, Bruce (2013). "Cosmological Argument". In Zalta, Edward N. (ed.). Stanford Encyclopedia of Philosophy. Stanford, California: Stanford University. ISSN 1095-5054. Retrieved September 28, 2018. ——— (2017). "Cosmological Argument". In Zalta, Edward N. (ed.). Stanford Encyclopedia of Philosophy. Stanford, California: Stanford University. ISSN 1095-5054. Retrieved September 28, 2018. Robinson, Jeff; Baggett, David (2016). "Craig, William Lane (1949–)". In Shook, John R. (ed.). The Bloomsbury Encyclopedia of Philosophers in America: From 1600 to the Present. London: Bloomsbury Academic. pp. 211–214. ISBN 978-1-4725-7056-7. Smith, Quentin (2007). "Kalam Cosmological Arguments for Atheism". In Martin, Michael (ed.). The Cambridge Companion to Atheism. New York: Cambridge University Press. pp. 182–198. doi:10.1017/CCOL0521842700.012. ISBN 978-1-139-00118-2. Stewart, Robert B. (2007). Intelligent Design: William A. Dembski and Michael Ruse in Dialogue (rev. ed.). Minneapolis, Minnesota: Fortress Press. ISBN 978-0-8006-6218-9. Viney, Donald Wayne (1989). "Does Omniscience Imply Foreknowledge? Craig on Hartshorneby". Process Studies. 18 (1): 30–37. doi:10.5840/process198918130. ISSN 2154-3682. Archived from the original on November 19, 2015. Retrieved October 5, 2011. "William Lane Craig". Contemporary Authors Online. Detroit, Michigan: Gale. 2007. Williams, Peter S. (2013). A Faithful Guide to Philosophy: A Christian Introduction to the Love of Wisdom. Milton Keynes, England: Paternoster. ISBN 978-1-84227-811-6. Zagzebski, Linda (2011) . "Foreknowledge and Free Will". In Zalta, Edward N. (ed.). Stanford Encyclopedia of Philosophy. Stanford, California: Stanford University. ISSN 1095-5054. Retrieved September 28, 2018. Meister, Chad. "Philosophy of Religion". Internet Encyclopedia of Philosophy. ISSN 2161-0002. Retrieved August 11, 2015.